It’s late November and this is only the first beach of the summer. I’ve been delayed by the hopes of sticking to my rule of visiting the beaches in strictly alphabetic order. Beach number 35 is Gunyah (Brooklyn) which can only be reached from the water so I’ve been waiting for my boat-owning friend’s schedule to mesh with mine on a day with fine weather. It’s proving a challenge so I decided to break the rules and set No 35 aside to press on to No 36. There are, I think, a couple of same-name, different-location beaches to be visited in this project but these are the first and they couldn’t be more distant from one another. The beach at Brooklyn is on the southern side of the Hawkesbury at the very northern reaches of Sydney. The beach at Bundeena is some 100 kilometres (62 miles) south on the southern shore of Port Hacking at the very southern reaches of Sydney. Gunyah means “an Aboriginal bush hut, typically made of sheets of bark and branches” and is derived from the word ganya from the Dharuk Aboriginal language – meaning “house or hut”. If you are interested in knowing more about the homes built by Aboriginal people this blog post is a good place to start. 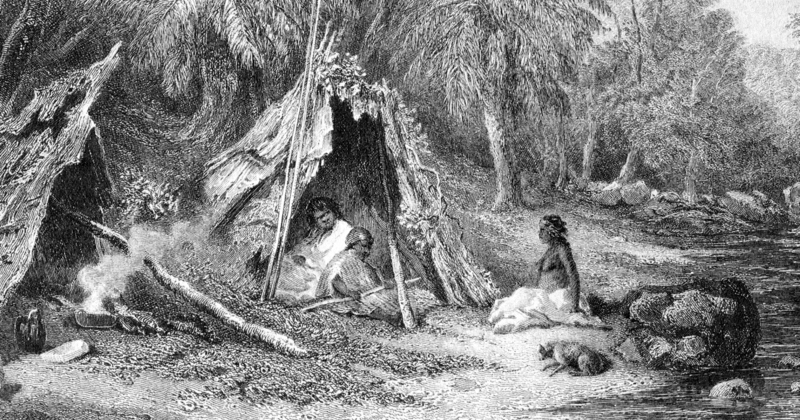 19th century engraving of an Aboriginal humpy or gunyah. The cicadas were screaming as I left my place – beach umbrella under one arm, swimming gear piled in a bag in the other – to catch the bus to Annandale. Laura and I have taken to meeting at Little Marionette when we are heading out someplace. She lives in Annandale; I take the bus there and she drops me back home afterwards. Walking to the café I began thinking of my departure next year. I’ll be off for a long bicycle ride around Europe and other places and expect I’ll be gone about a year. I was thinking of my mates seeing me off at the airport and I got a little teary … it’s still 26 weeks away. Oh, wow – six months today. I’ve been reading Dr Caroline Ford’s Sydney Beaches: A History – she quotes a letter to the editor from the early 20th century suggesting how a properly deployed towel will provide the beach goer all the modesty needed to change from street clothes to swimming attire. I’ve felt for some time that my willingness to use this method was a proud mark of my Australianness. And so it was, that we changed at the car – towels used to cover what modesty decrees should be covered. 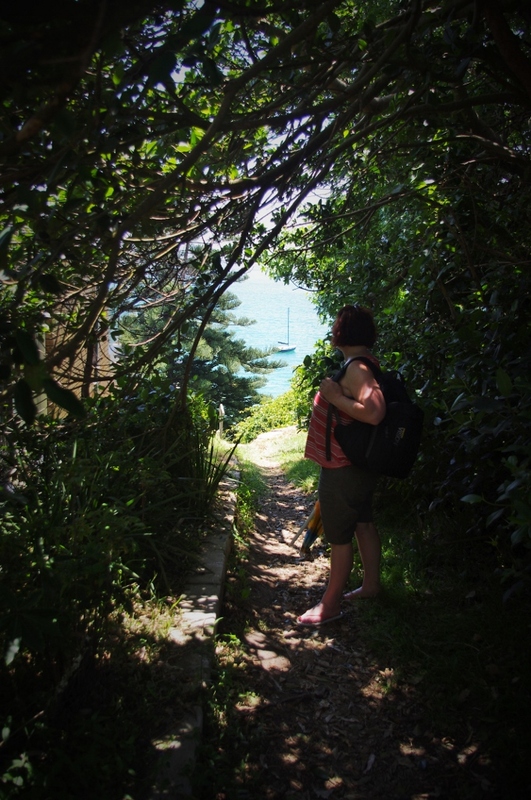 There’s a charming, discreet, narrow and steep path down to Gunyah. The beach is just east of the ferry pier but around a small rocky headland so, while busy, it wasn’t teeming with the masses. It runs maybe 150 metres or so – a shallow curve of maize-coloured sand from one rocky platform to another. The beach – neither wide nor narrow, perhaps 20 metres deep – backs, in part, on to bush but otherwise on to houses. Including an adorable holiday house which seems stocked with surfskis and paddle boards. There were families and groups of friends. A few fishing lines were in the water. A scattering of boats were 100 metres out. Further out in Port Hacking sailing boats tacked back and forth on the choppy water. The sounds were of waves lapping/crashing (what’s louder than lapping but softer than crashing? ), jet skis in the distance, children’s voices and women’s laughter. We planted our gear and plunged in … Laura first, and with expediency. Although I know better, I tip toed in as I do – when the water tickled my ribs I counted to three and dove in. The water was deliciously cool and, for being so near one of the world’s great cites, so very clear – slightly green, running to a hazy horizon kissed by clouds, but higher – a sun-blasted sky, the blue burned out. 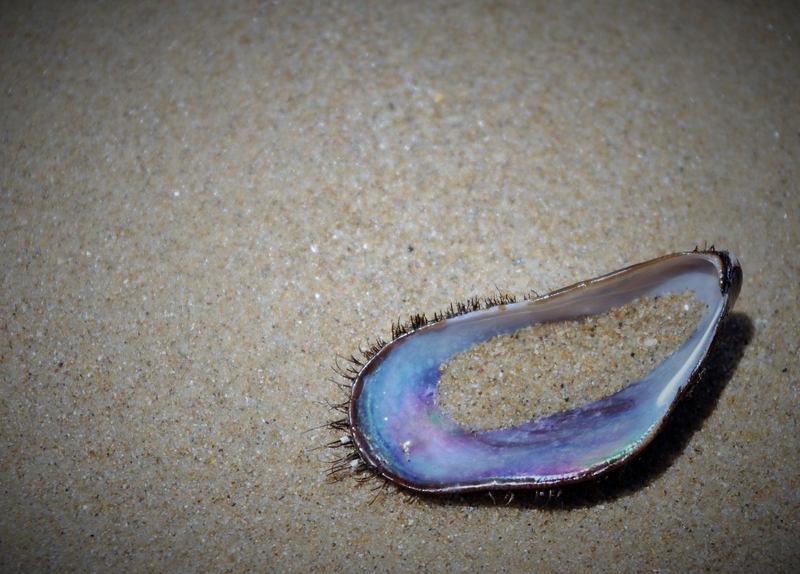 Once in, the sea was lovely, cooling, relaxing, a space all its own. We were hanging, floating – just suspended, toes dancing on a sandy bed. Kids were floating in an inflated ring while boys were throwing around a football and newbie paddle boarders were trying to find the magic. I love it, I love being here, in this water, in this city and I will miss this project when I’m away next year. Missing this project will be but one piece of missing this city. 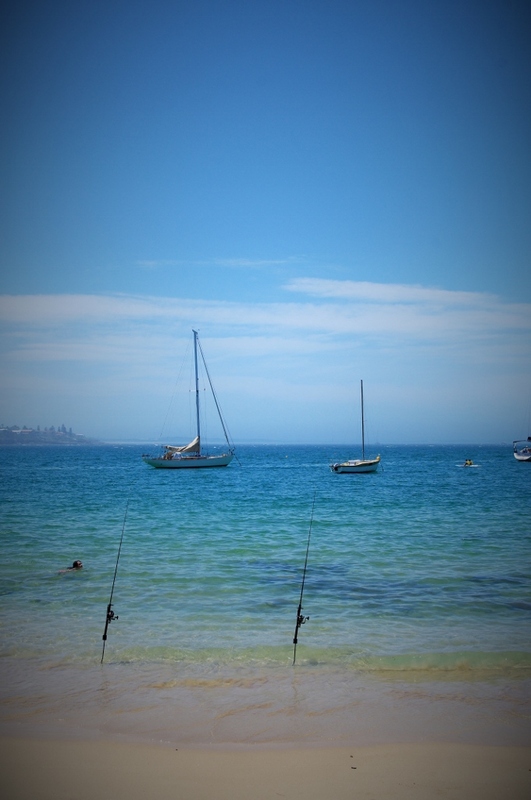 But I will try, when possible, to spend time near water on Sundays while I’m travelling and to write about them here. I like that, I like that idea. As we emerged back onto the suburban street from the narrow path up from the beach a woman asked Laura if this watch, left on a post, was her’s – it wasn’t but it was mine. I must have dropped it when I got my camera out as we arrived. The woman seemed a little sceptical that is was mine, but it was. I love Australia. My watch isn’t worth anything but I think in many places someone would have pocketed it. Here someone had found it and put it in a prominent place hoping the owner would find it – and I did – thanks to the woman who asked Laura about it but hadn’t actually found it herself. The sea and saltiness made the choice of seafood for lunch so obvious as to not really require discussion. 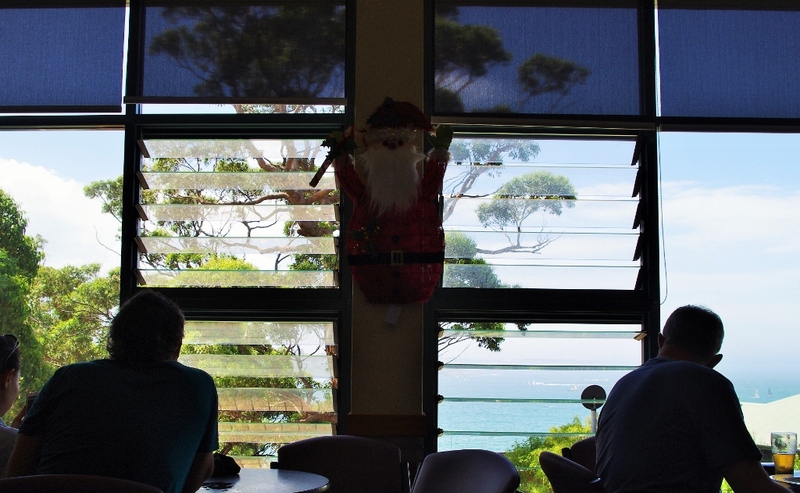 To the Bundeena RSL we went – the Irishwoman taking orders at the bistro warned of a long wait but we weren’t in any hurry and ordered fish and chips and crumbed calamari rings. 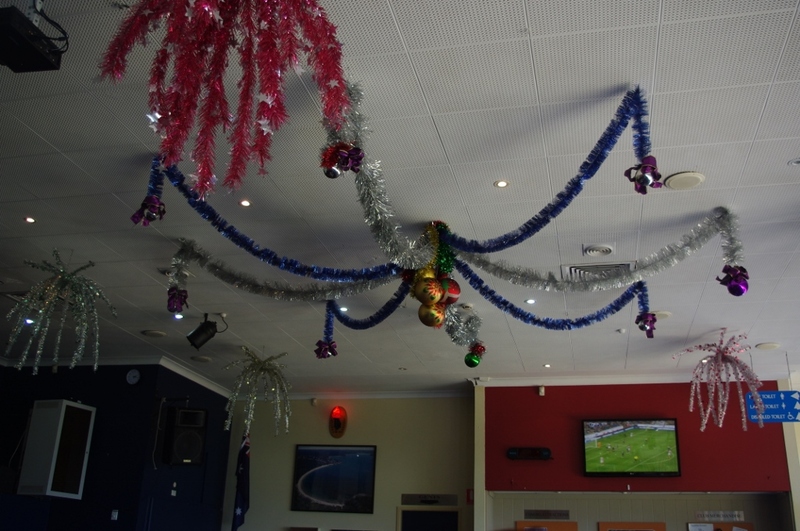 We got cold beers and waited while looking out at the sea past the Santa Claus decorations and admiring tinsel and cheap baubles strung on the ceiling. The RSL’s Eternal Flame is a bulb behind red flame-shaped plastic situated above a picture of the beach. The Queen – perpetually just coronated – takes in proceedings from over the doorway. Blokes are sitting near the open windows but have their backs turned to the azure sea so as to watch the One Day cricket on the TV. Lunch was lovely – just the right amount, cooked well, good chips, and nice diverse salad. Walking back to the car – a pair of parrots, green ones, darted from a bush and attacked Laura. Well, one ran into her and both the bird and Laura were startled. On our first stop on Gunyah I’d forgotten my sign in the car – now armed with that we headed back down for a few more photos but when we got there the water was again so tempting we plunged back in – and it was just as lovely as before. We sat a little on the rocks, in the sun, drying and talking about choice and fear and recognising the difference between can’t and won’t. A toddler was exploring the rocks, making full use of his limited grasp of balance – parents with an eye on him but 10 metres away. It was good to see a child that age allowed to explore like that. The mistiness seemed to be gathering into threatening clouds as we got in the car – but it held and we stopped at the Audley Weir for cups of tea and thick, rich brownies. The tail-enders were still scattered about the park and out on the water in the rental paddle-boats. A very buff dad – shirtless and in boardies – and his five year old son tried to figure out how to throw their boomerang. We drove back to the city enjoying our lingering saltiness and thinking our various thoughts of what we had to do … today, this week, this month, etc. I love Sydney and we spent a certain amount of time talking of our mutual love of our adopted town. Laura is contemplating a career-driven temporary move to Asia. The worst thing about that for her is leaving Sydney. And I know exactly what she means. 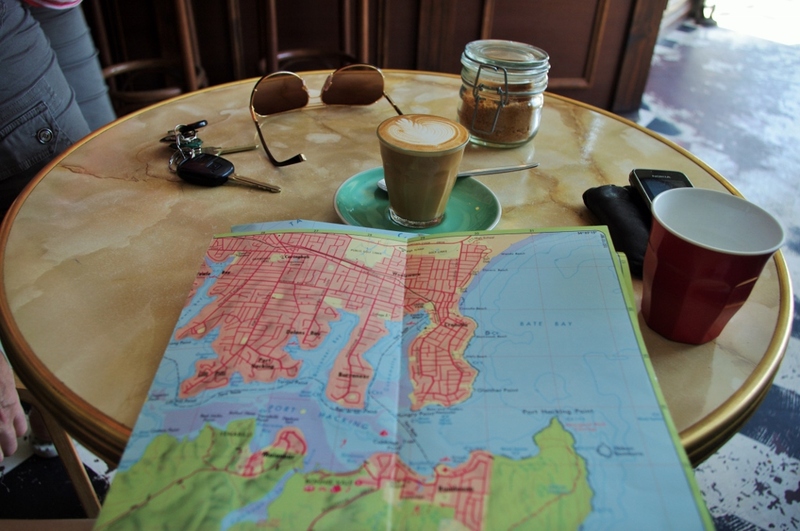 As much as I am looking forward to my big adventure next year – the excitement, the discovery, just leaping into an unknown space – I’m going to miss Sydney and Australia with heartbreaking intensity. I know there will be times when I will weep lonely tears for the place and for my mates here. I know that I will look longingly at photos of Sydney and that I will watch, through teary eyes, cheesy awful things like the Qantas choir singing I Still Call Australia Home. I will be away from Australia long enough to truly feel Australian. I think it’s an important rite of passage for Australians: to go away long enough to really miss it – to imagine the smell of bushfires and eucalyptus, the particularity of the huge blue Australian sky and the sound of the birds: the cry of the kookaburra, the chattering racket of the cockatoos and the screeches of the rainbow lorikeets. But that’s all months away yet. In the meantime this summer awaits and with it as many beaches as can be managed. 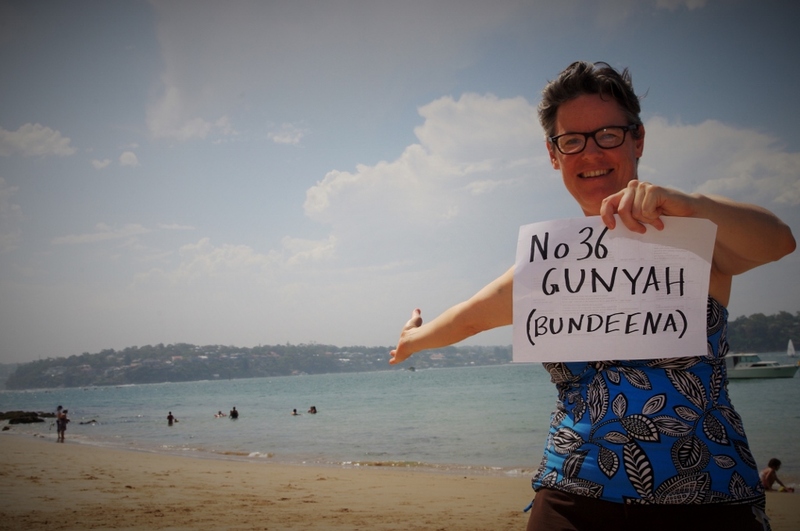 Gunyah Beach (Bundeena) is 52 kilometres (33 miles) from home. It’s in the Sutherland Shire Local Government Area, Heathcote State Electorate (Lee Evans, Liberal) and Cunningham Federal Division (Sharon Bird, Labor) [Wow! A Labor beach! I don’t know the last I’ve visitied].